And The Whole Sky Fit in the Dead Cow's Eye (Trailer) from Francisca Alegría on Vimeo. The same day that 55 cows appear dead in a little Chilean Village, Emeteria (85) is visited by the ghost of her patron, Teodoro. She believes he has come to take her to the afterlife, but he has more devastating news. 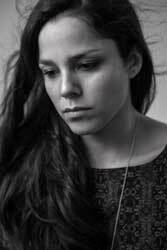 Francisca is a Chilean filmmaker, currently working in Chile and USA. She recently earned her MFA in Film Screenwriting & Directing from Columbia University. Her short film And the Whole Sky Fit in the Dead Cow’s Eye, produced by Columbia University collaborator Birgit Gernboeck, received two Jury Selects and the Audience Award during the Columbia School of the Arts Festival in New York and was selected to be shown in Los Angeles in June, 2016. It also received the Katharina Otto-Bernstein Award for Film Production. And the Whole Sky Fit in the Dead Cow’s Eye is viewed as a visionary work of art and Francisca will explore a similar world and storytelling approach in her first feature The Cow that Sang a Song About the Future (Chile, 2017).